On Friday morning I received a short txt from my sister. It simply said, “Nelson Mandela died”. I am willing to admit that it was only after checking three different news outlets did I believe her. Not because I thought my sister was untruthful, but it was news I did not want to believe. Mandela is a person who features on my list of “dream dinner party guests”. I would have loved the opportunity to sit down and talk, to hear first-hand of his experiences and ask him about his opinion on various issues. While undoubtedly I admire Mandela because of the nature of the change he was instrumental in bringing to South Africa and the principles he stood for, what I possibly admire most is how he brought about change. Like many others, these past few days have seen me contemplate the legacy Mandela has left not only to those in South Africa, but to all of us. So complied below is my list of the lessons I have learned (or are still learning) from Mandela. First, never give up. I imagine after a lifetime of personal campaigning, it would be at times, easy to think that you are never going to make a difference, that nothing is ever going to change. But the ending of apartheid in South Africa proves to us all that with perseverance things can change, the status quo does not have to be the way we always do things. While tradition should not be forgotten, tradition should not prevent us making change that creates a more just society with equal opportunities. Second, do not hold a grudge. I doubt that if I were imprisoned for the time and reasons that Mandela was, I would walk out of prison willing to forgive those who put me and kept me there. Forgiveness Is a message that is taught not just in Sunday schools but also primary schools (though in a slightly different format), however no matter how many times I am told about forgiveness, when it comes down to it, forgiveness is something I still struggle with. My guess is that the reason I struggle with forgiveness is that it often implies, right or wrong, that someone gets away with something and does not have to face the consequences of their actions. However what I am slowly beginning to realise is that forgiveness is not about letting go for the sake of letting go, its letting go for the sake of moving forward. Third, sometimes you need some help as it is impossible to do some things alone. Mandela did not end Apartheid alone. While it would be nice and tidy to say that he did, nothing is ever that tidy. Not only was Mandela supported by members of the ANC but he had support worldwide. Eventually he was able to work with those who represented what he for so long fought against. It was only when Mandela and others worked with those who they once worked against that change began to occur. Many people forget that the 1993 Nobel peace prize was shared between Mandela and F.W. 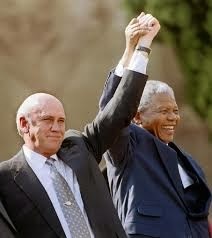 DeKlerk (the president of South Africa at the time of Mandela’s release and the person who headed negotiations between the government and those campaigning for the end of apartheid), but I feel that it is only right that it was shared as alone, neither could have ended apartheid and united the people of South Africa. 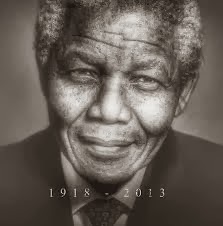 Nelson Mandela will probably always be a personal hero of mine. His ability to display grace and forgiveness despite his personal circumstances never ceases to amaze me. Few would disagree that he left behind a country better off than it was when it arrived. I pray that his legacy means that each of us learn something from his story. While not all of us are destined to play a role like he did, there is nothing stopping us from following his example and gracefully campaigning for equal opportunity for all. Samantha Ward is the Social Policy and Parliamentary Unit's summer intern for 2013/14. Samantha has just completed her first year at the University of Victoria doing a double degree in law and bio-technology. Samantha is also soldier in The Salvation Army and enjoys coaching and umpiring netball.